Play on any Nintendo NDS and NDS Lite and ndsi and ndsll and ndsxl and 3ds. We will send all the product within 24 hours! "Super Mario 64" was a launch title for the Nintendo 64 in 1996. 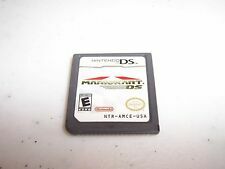 It's only fitting that "Super Mario 64 DS" was a launch title for the Nintendo DS in 2004. In "Super Mario 64 DS," a port of the original game, Princess Peach has once again been kidnapped by Bowser. To rescue her, you'll need to traverse her castle and search it room by room. In each castle is an interactive painting that takes you to a new area. The more Power Stars you collect in these areas, the more of the castle you unlock. After achieving 80 Power Stars, you'll unlock the final battle. "Super Mario 64 DS" plays similarly to other Super Mario Bros. titles. You'll run, jump, and stomp on the heads of your enemies. To gain Power Stars, you'll complete objectives in each level. Goals can range from gathering coins to completing quests for NPC characters. While "Super Mario 64 DS" on the Nintendo DS is primarily an action adventure, Nintendo keeps the action fresh. The company does this by regularly introducing new gameplay styles. For example, on one level, you are in a race against multiple opponents. Another stage may challenge your wits instead of your reflexes by having you solve puzzles. This Mario game features a significant number of changes from the Nintendo 64 title. The biggest difference is that you can now play as four characters. While the original game starts with Mario, this one starts with you playing as Luigi. Over the course of the game, you'll unlock the ability to play as Mario, Wario, and Yoshi. Mario appears with his blue overalls, red shirt, and red hat. The other characters are featured in their classic forms as well. Each of these characters has unique abilities to use that are original to this version. Mario can inflate himself like a balloon and float across the level. Luigi becomes invisible and hides from his opponents. Wario can become metal, allowing him to sink to the bottom of the ocean. Yoshi can breathe fire, letting him ignite both enemies and torches. You'll need to master each of these abilities if you want to get every star in this Mario game. "Super Mario 64 DS" adds 30 extra Power Stars to the experience. Each one is hidden somewhere in Peach's home and requires you to use each new ability. The title also takes advantages of the fact that the DS has two screens. The actions of Mario, Wario, Yoshi, and Luigi are always displayed on the top screen while the bottom screen holds an interactive map. If you're looking for a fun way to enjoy this classic, you can use the touchscreen to control your character instead of regular buttons. Once you save Peach from Bowser, the fun is just beginning. Not only does this Super Mario version feature 36 minigames but it also has a multiplayer mode. In multiplayer, up to four friends can fight against each other in various arenas. This DS game can feel like a sequel to the original title instead of a port. Super Mario fans of all ages can find this an excellent addition to their collection. Great engaging Single Player- Check Fun Multiplayer- Check One of the best handheld games ever made without question. This is one title you can pickup and play and instantly have fun with. The addition of the mini games only adds to this games lasting apply. Highly Recommend.